1. 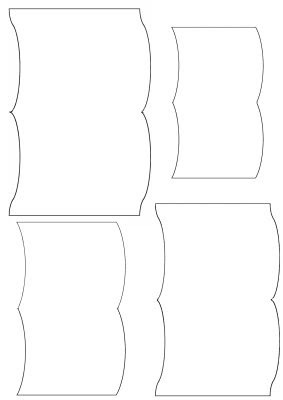 Cut out you template carefully (I laminated mine to make them last longer). 2. Now trace around the page templates on patterned pages. Cut out. 3. Score and crease all pages. I also curve mine by rolling them around a small rolling pin (1 inch Diameter). 4. Now attach the pages with the spines directly in top of the each other. I use Double sided tape or Glue lines made by Glue dots. The Glue lines work really well, especially when you use vellums. 5. Now mount your book on the prepared Base Card with Double sided tape or Glue Lines. Allow ¼ inch on both sides of the base card and then attach the sides of the bottom page to the base, this give a bit more dimension to your card. 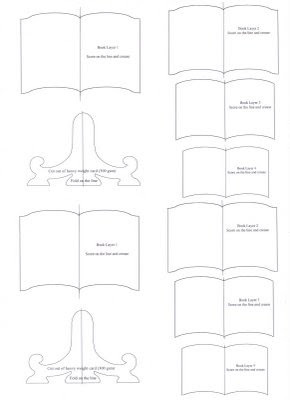 You can also use double sided foam pads or silicon glue to support the bottom page. 2. Now trace around the Stand templates on heavy duty card. Cut out. 3. Score and Crease down the middle. Decorate as you choose.